Posted June 3rd, 2014 by Peter Lewis & filed under Sustainability, The Inside Peak. We are stoked to have Carl Kish with us this week! Carl is Safari Surf’s Director of Sustainability. Carl exudes a laid back confident stoke that is catching. We are hearing more and more these days about this word “sustainability”. I was finally able to learn from the man himself about this intriguing new direction Safari Surf School and surf tourism is headed. Originally from San Francisco, Carl graduated from San Diego State University with a B.S. in Sustainable Recreation and Tourism Management. As an intern for the Center for Surf Research at SDSU, Carl helped the Center’s director Dr. Jess Ponting develop the Sustainable Surf Tourism Certification Program and acted as a sustainability consultant for Tavarua Island Resort and the Hotel Casa Tucan (Safari’s former home). As Sustainability Director, Carl is developing Safari Surf’s Sustainability Management System which encompasses all aspects of our business: environmental impact mitigation, interpretation, wildlife conservation, cultural preservation, supply chain management, and community development. Carl is also the Affiliate Program Manager, contacting surf schools all over the world to form new partnerships and establish various opportunities for more people to discover the paradise that is Nosara. Costa Rica has long embodied a healthy attitude towards all things environmental. With over one quarter of its land mass preserved in wildlife refuges, reserves, and parks, the country is poised to embrace this new wave of sustainable tourism concepts. Carl serves as an ambassador and liaison in advancing this new culture with innovative practices. PL: Welcome back Carl! I remember when you first came on the scene here a couple of years ago, working with Dr. Jess Ponting on benchmarking the Casa Tucan Hotel for sustainability. Tell us how it all started. Carl: I began my college education at San Diego State University in 2008. I was interested in working in surf tourism in some capacity. I enrolled in the school’s hotel management program, figuring this was the logical starting point. At the end of my freshman year I caught wind of a new major being offered in Sustainable Tourism and Recreation. This caught my interest so I investigated. PL: Is this where you met Dr. Ponting? Carl: Yes. Dr. Jess (Ponting)is from Australia and is now an Associate Professor (recent promotion) at SDSU! His vast travels in surf tourism zones around the world have revealed that without proper planning and management, severe environmental damage in the form of erosion, deforestation, and pollution were inevitable. Not to mention exploitation of the local communities which inhabit these surfing areas. Jess felt certain that carefully planned and managed sustainable surf tourism could be the driver to bring conservation and community development to thousands of coastal communities in the less developed world. PL: And thus the Center for Surf Research was born? Carl: Correct! Dr. Ponting went on to earn the world’s 1st PhD in sustainable tourism management and in 2010 began the Center for Surf Research, a nonprofit educational facility housed in the school of Hospitality and Tourism Management at San Diego State University. PL: Wow, so this was exactly what you were looking for! Carl: Yeah it all kind of fell into place. I changed majors end of Freshman year and graduated in 2012 with a Bachelors in Sustainable Recreation and Tourism Management. PL: What does the CSR do? Carl: Many things! We offer field-based courses in sustainable tourism management and provide opportunities for internships, study abroad, volunteering, and research. We foster partnerships with governments, the surf industry, and tourism developers and the development of an accurate and viable sustainability reporting process. PL: This is all so fascinating and cutting edge. Great work Carl and press on! Carl: See you back in Nosara soon! ¨Carlito¨ – You’ll never meet a more positive human! Part 2: An inside look at Olas Verdes Surf Resort! Starting on the 2nd Level of the Clubhouse! The highly anticipated Olas Verdes Surf Resort is expected to open in April 2015. The facility will feature 17 upscale rooms with a large clubhouse and pool. The clubhouse will accommodate the hotel reception office and Safari Surf Schools office/operations center. The most impressive aspect of this project is the dedication to sustainability in all areas of the operation. “Sustainable development is development that meets the needs of the present without compromising the ability of future generations to meet their own needs.” Under the direction of Olas Verdes’ Project Manager, Carl Kish, the project endeavors to become the first LEED Platinum Certified Hotel in Costa Rica. In the United States and several other countries around the world, LEED certification is the recognized standard for sustainable design and construction. The LEED (leadership in energy and environmental design) green building rating system is developed to promote design and construction practices that increase profitability while reducing the negative environmental impacts of the building process. LEED standards measure all aspects of sustainable building sites: water efficiency, energy and atmosphere, materials and resources, landscaping, and indoor environmental quality. Carl took me on a tour of the Olas Verdes construction site and pointed out several of the sustainable innovations required for LEED certification. 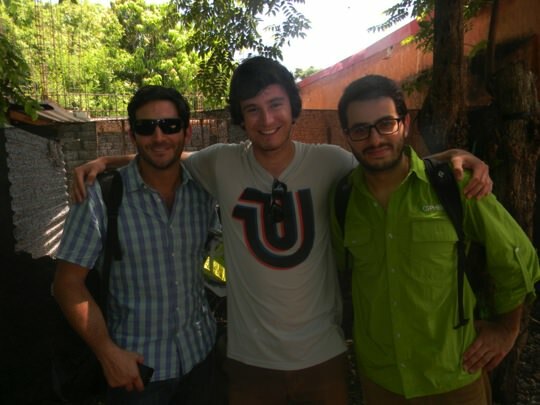 Carl (middle) with LEED consultants Fabricio and Federico from SPHERA. The Olas Verdes Surf Resort is being constructed by Guanacaste Builders of Nosara. This will be their first LEED certified project to date, and serve as a model of sustainable building practices throughout Costa Rica. The building will be earthquake proof and will include two 7,000 liter rainwater collection tanks recycling water from natural precipitation and air conditioning units. There are three waste water treatment tanks that will convert black water to treated greywater for reuse through the resorts irrigation system and toilets. Only native vegetation will be planted, and interpretive signs will identify all plant and tree species in the landscapes. The resort will maintain an organic garden and compost all biodegradable matter. There will be solar water heaters and solar panels throughout the resort, which will result in 20% of the resorts total energy being supplied by solar. All construction waste is identified, sorted, and disposed of in LEEDS approved recycling facilities. There are many more sustainability initiatives in all facets of the construction, resulting in a state-of-the art surf resort. Carl explaining the new pool design that will blow your mind, but you’ll just have to wait! Guanacaste Builder’s worker stoked on the on-site recycling center. Rocks at both entrances catch any mud or pollutants on the truck’s tires before entering public roads. Sedimentation barrier to protect the stream from runoff on the construction site. *STAY TUNED FOR FURTHER UPDATES ON THIS INCREDIBLE PROJECT! **NEXT WEEK – MEET THE MARSH FAMILY!